As the lands of Ferelden are overrun by a Blight, the Hawke family escapes across the Waking Sea to the city of Kirkwall. Here they make their new home, but the city is riven by tensions between the templars, the Chantry and the mages of the city. There is also trouble brewing between the natives and the Ferelden refugees swamping the city, as well as a boat-load of Qunari who have taken refuge in Kirkwall despite their disdain for it. Over the course of seven years, one of the Hawkes will rise to become the Champion of Kirkwall and will decide the fate of the city...and possibly all of Thedas. Dragon Age II is the successor game to Dragon Age: Origins, although not a sequel in the traditional sense. It takes place in a different location with a (mostly) different cast of characters with, unusually, a much smaller and tighter focus than the first game in the series. These changes have proved controversial, with praise for the focus, the writing and the characters being contrasted with harsh criticisms of gameplay changes and problems resulting from the game's rushed development. BioWare released Dragon Age II in early 2011, only eighteen months after the release of Origins. Electronic Arts, which took over BioWare shortly before Origins's release in late 2009, is alleged to have mandated a 'quickie' sequel to be developed on a very tight time schedule and budget to help make up for the lengthy (and therefore expensive) five-year development of Origins itself. There was resistance to this at BioWare - the lead designer of Origins quit in protest, fearing the game would suffer from being rushed out of the door - but ultimately they had to comply. At the same time, EA seem to have been rather impressed with Mass Effect 2 and various mechanics from that game, such as the dialogue wheel and the loyalty missions, were transposed over to Dragon Age II. The result is a schizophrenic game that hangs between some excellent conceptual ideas, characters and writing but in which the gameplay feels like it's been compromised to make up for it. It's still very playable and very enjoyable, but it does feel like a game that's been rushed out before it was fully ready. To deal with the bad issues first, the most annoying problem is combat. Battles in the game start in the traditional manner with you spotting a bunch of enemies and engaging them. However, most battles will see additional 'waves' of enemies arriving (usually just as you think the battle is about to end) who can't be seen coming and can attack from any direction. Early in the game there seems to be more care taken about how these enemies arrive (jumping down from rooftoops or rushing in from nearby buildings) but by the end the designers have given up and enemies simply materialise directly onto the battlefield. This means that positioning your characters in the best place to have an impact on combat is now futile, as you can be swamped from any direction at any time and not be able to do anything about it. 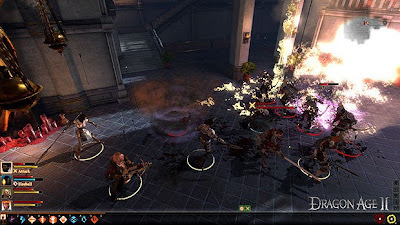 The developers help you out by turning off the 'friendly fire' option on area-of-effect spells (you can switch it back on again at the higher difficulty levels), so you can firestorm the heck out of massed gangs of enemy without fear of sustaining injury, but this simply removes the (limited, but still present) tactical realism of the first game and makes the whole thing feel too arcadey. This is not helped by the fact that Dragon Age II has simplified inventory management beyond even the heavily-streamlined mechanics of the original. Your companions' armour cannot be changed at all, although you can give them different magical amulets and rings. Only Hawke's weapons and equipment can be changed at will. Another major problem is the re-use of the same maps for locations. All the mines in the game have exactly the same lay-out as one another. The same is true for mansions, caves and sewers. The developers drop different partitions into the maps to try to change things up, but they are all clearly the same places (and the mini-map never changes to take into account the partitions, often resulting in you going down dead-end passages which are shown as being open on the map). Obviously this is a result of the crippling budget issues, but even so it's repetitive and monotonous to the point of boredom. The final issue is the lack of choice in the game: major events happen in the game which it is impossible for you to influence, even when it feels like you should be able to (some of Anders's actions in the endgame, most notably). This silliness reaches its zenith in the climactic battle where you have a lot of choices to make and the battle ends up unfolding more or less the same way regardless. The much greater freedom and resonance from your decisions seen in Origins is absent here. So, weaker combat than Origins (and Origins itself was riddled with some major problems in that regard anyway), a lack of choice and some seriously bland locations should all make for a poor game, right? Not entirely. Dragon Age II does do a lot of other things right. Most importantly, it is far better-written than Origins. Dialogue is less expositionary and portentous. Instead, it's more naturalistic and enjoyable. The voice acting is superior right across the board and the companion characters are more interesting. The 'loyalty mission' mechanic from Mass Effect 2 also helps in this area. Each companion has their own interests, problems and issues to deal with, and by helping them out you can improve their loyalty to you. This will determine who stays with you, who turns against you and who flees during the culminating battle. It's a nice idea as completionists will want to complete all of the companion quests, resulting in a better understanding of the characters (in Origins there was a whole bunch of characters I left in camp and never bothered with because the game never gave me a reason to use them over my core team) and their relationships with one another. BioWare have done a better job of giving the characters their own arcs (some rather tragic) and making them deeper and more complex than those from the first game. Additionally, the story and worldbuilding are much better-integrated with one another. Origins suffered from presenting Thedas as yet another epic fantasy identikit landscape, with the more interesting background elements (such as the the templar/mage tensions and the Qunari) kept to one side in favour of dealing with the generic horde of generic monsters. Dragon Age II, on the other hand, brings these elements front-and-centre and makes them far more compelling as a result. The game also tries to make up for its lack of scale and smaller number of locations by using Kirkwall as a city in which the affairs of the larger world are both reflected in micro and can also cause reverberations across the continent, acting as a sort-of medieval fantasy version of Babylon 5's titular space station. It's an idea that almost works, though the fall-out from the events of this game will not fully be explored until Dragon Age: Inquisition (the forthcoming third game in the series). 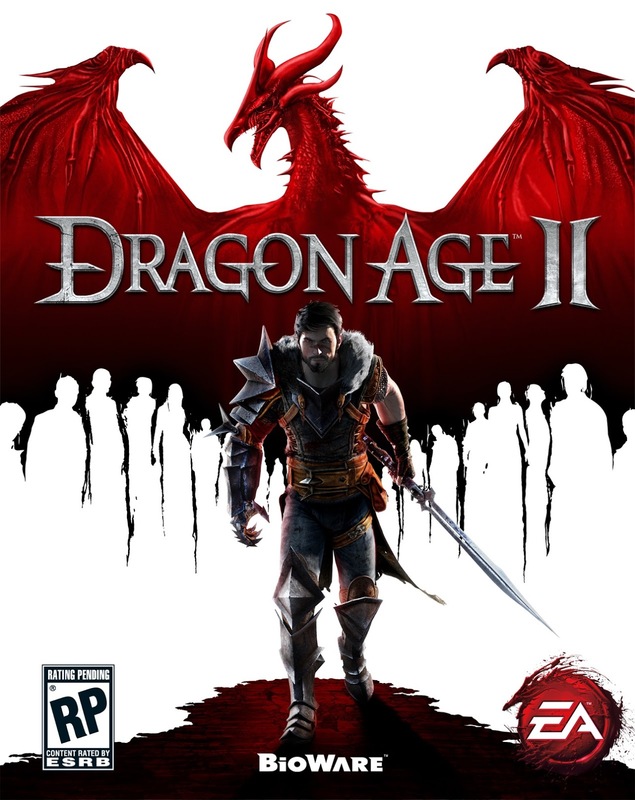 Dragon Age II substitutes the epic scale of Origins for something more focused and intimate which has its drawbacks (Kirkwall is a well-designed city but you'll be sick of it by the end of the game) but broadly works in furthering the game's themes of tolerance, coexistence and family. Dragon Age II (***½) is a far cry from the unmitigated disaster some have labelled it as. It has some problems, sure, but then so did Origins. In fact, the two games seem to have swapped their issues: Origins had better combat but poorer writing. Dragon Age II's combat is less satisfying but the writing, story and characters are superior. Ultimately, the two balance out, leaving Dragon Age II a reasonable - if flawed - companion game to the flawed - but enjoyable - original game. The game is available now in the UK (PC, X-Box 360, PlayStation 3) and USA (PC, X-Box 360, PlayStation 3). Another major problem is the re-use of the same maps for locations. All the mines in the game have exactly the same lay-out as one another. Yeah, that got old really, really fast for me. The reason DA2 was an unmitigated disaster to me is not that it was the worst game ever, but because they injected all those "great" mechanics from Mass Effect 2. Don't get me wrong: I loved Mass Effect 2. It shaved all the rough edges off the original Mass Effect and made a fantastic filmic Rpg/shooter hybrid experience. But that completely went against the spirit of what the Dragon Age series was promised to be: a call back to Baldur's Gate, and the Infinity Engine era. A modern, spiritual successor. Origins had its flaws (that horrendous tiered item system, uninspired filler bounty board fetch and collect them all quests!!) but it did deliver on that front for me. It felt more like Baldur's Gate 2(the greatest game ever IMO) than any game before or since. Then came DA2 and they threw all those game mechanics overboard in favor of an action styled fantasy Mass Effect clone. My disappointment could not be contained. Also the art direction was ugly. And those reused locations clearly indicated a rush job. Then ME3 came and I realized EA killed yet another once great studio. No, I'm not bitter, ... much. If you're looking for me I'll be throwing money at Obsidian (oh, how I hope they don't mess this up) and InXile (I'm actually very confident in them.) on Kickstarter. Cannot agree that dialogs are better, the wheel just kills them at all for me. In DA:O you at least have to read what are you saying, and your choices matter very little. Companions are better, however three of them did appear before (Anders, Isabella and Miriel). Still in DA:O you can kill every party member you don't like, but not here. I personally love DA 2 and is one of the few who think it is better than DA. However, I can understand why people hate it. DA 2 took some chances and was not always successful with them. It's...different, and not always for the better. Take the final battle for example. Like the article said, at the final battle, no matter what you do, the end result is the same. You may be the Champion of Kirkwall but at the end, you are not the hero. In fact, your presence makes things worse. It's beautifully written but I think a lot of guys are pissed about not been the hero of the story. OBLIVION had the same issue: you were the enabler and fixer who ran around sorting things out to allow Sean Bean to be the hero, which I thought worked out pretty well (although OBLIVION was still hugely flawed in many other departments). However, it got a lot of criticism for the exact same thing. At least in ES: Oblivion, you actually help. The hero would have been dead several times over if not for you. In DA 2, the force of nature that is the Champion of Kirkwall makes things worse. Your presence actually help start a war between the templers and the mages. The most disappointing atrocious sequel to an amazing game. Ranks with the world's most heinous game sequels..Devil may Cry 2, Resistance 2..DA2 made me want to never play a game again. Truly Horrible/ an ABOMINATION.